The March WebComm Workshop featured guest Dustin Schmidt – Staff Photographer, Videographer and Director of Interactive Media at Old Hat Creative, a creative agency located in Norman, OK. Over the last several years, he has shot photography and directed videos for numerous athletic clients across the country, but his favorite project is always the next one. 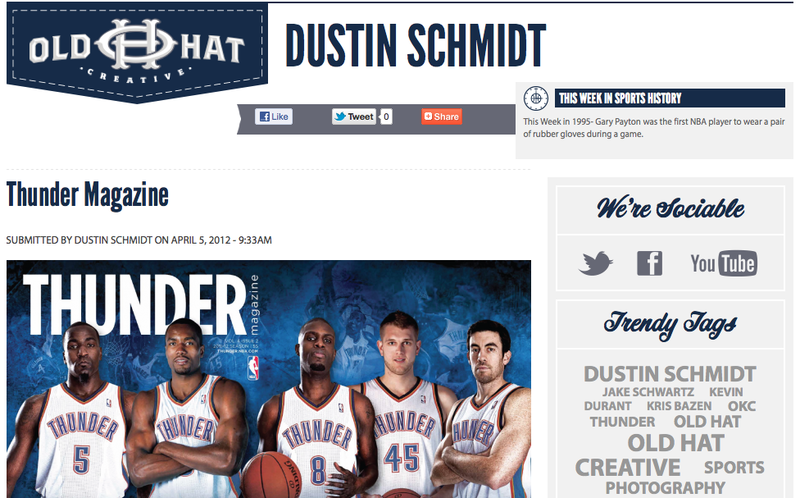 As an Oklahoma City Thunder fan and always in awe of what great photographers do, I really appreciate Dustin’s blog posts for Old Hat. 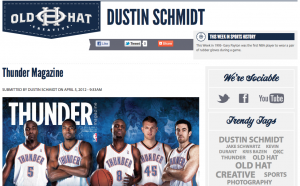 He gives behind-the-scenes views of the Thunder, editing tips and photo insights. Cameras – It’s not just about pixel size. Sensor size is more important than pixel size. The larger the sensor, the more light the camera can capture. Shooting early in the morning or late in the day are your best bet. Mid-day light sometimes makes for very harsh shooting conditions, especially for portraits. Here are some Photoshop tips for blending two different exposures. This sounds like unnecessary advice, but tripods help for more than just stabilizing your image. Keeping your camera stationary allows you to shoot double-exposure. Set up one shot to properly expose a background and one shot to properly expose the subject. This is particularly useful when shooting someone in front of a bright window. Get close to your subject without having to physically get in their personal bubble. When you want to get a close shot, set up the tripod close to your subject and use a remote to take the photo without making them uncomfortable. Use different lighting techniques to create different moods and emotion in photos. Lighting in photos should be flattering to the subject, credible to the environment and interesting to set a mood. Hard Light – Bright white highlights, little fill in the front. Gradation between light and dark is very abrupt. Good for athletes, men. Small light source. Soft Light – Better for portraits. More flattering light. Gradation falloff is a lot more gradual. Strobist.com – Blog from an ex newspaper photographer – how to light & working with small flashes. **This is a part of the OU Web Communications Lunch & Punch series featuring topics and presentations for web communicators at OU. Please visit here for more information about these workshops. Thanks for all your hard work. These great tips will be very useful for me in the future.